Amazingly comfortable, according to most of the reviewers. The GT 1000 5 is significantly lighter than the past model. It looks better and more sophisticated than the prior version. There are 5 different color options. It is very stable without compromising weight, based on the comments of several runners. A handful noticed that the toe box has more room in the 5th version of the GT 1000 than earlier editions. Breathability is excellent, as remarked by more than a few. The overall support is improved in the 5th iteration of the GT 1000, as observed by several runners. A small number of runners have used it for gym workouts. Durability is quite good in this shoe, as reported by more than a few reviewers. The interior has adequate volume to accommodate different kinds of orthotics, based on the comments of more than a few reviewers. A handful noted that it runs a bit small. A few had to give the shoe a break-in period. The forefoot is rather tight, according to a small number of runners who have tried the earlier models of this series. A handful of runners found the 4E and 2E options as too narrow. Some runners experienced rubbing on their big toes. The Asics GT 1000 5 is a middle to high-mileage stability trainer that works as designed. While it may not be as popular as some of Asics’ flagship stability shoes, it delivers a firm and responsive ride that slight to moderate overpronators should be very comfortable with. With average price point, runners can expect a durable shoe with lots of comfort and reliability for the rigors of day to day running. As a longtime Asics guy, I thought I’d try another GT-1000. The three was a comfortable, supportive shoe for both roads and trails. So with the 6 coming out I’d save a bit of money on a 5. All good thoughts towards trying the GT 1000 5. The initial fit and feel was classic Asics – true to size, not as much room as I like for the nail of my big toe, not too much cushioning. I noted a slight pressure on the medial side of my right foot near the front of my arch. I tried two different boxes and the same with those, but a little less. The silver and maroon was not my first choice of color as the lighter colors show the dirt more than darker ones. Let’s go for it, they will compress a bit and feel fine. Noticeable on the first run was the lighter weight than previous editions of the GT-1000 and the heel cup fit was a bit more loosely than I prefer. Additionally, the wide mesh upper provides a cooler ride. The hot spot remained, but did not seem to bother me too much. The 5 has a stout, strong feel to the upper. A little more meat than I care for, but that makes the tongue comfortable even if you tend to lace your shoes tight. The lightly laced shoe has a snug but not tight feel, kind of like a quality glove. The DuoMax and spEVA combo have always been a sure bet for me. The 5 did not fall short in this area. Its road and trail support and stability was better than most other mid-range shoes. It did not handle well on the one and the only muddy trail that I wore them on since it is not designed for that terrain. Performance on the road is excellent. The AHAR plugs give a longer life to the outsole for us slight pronators. Now for the explanation of the title of this review. After 180 miles the hot spot remains. I’ve beat on it with a hammer, changed insoles and worn different thickness of socks. All to no avail. Since I rotate three pairs of shoes on a regular basis I’ve ended up using these only twice in a twelve-day cycle. Compiling value, comfort, durability, and performance, the overall performance is above average and materials are durable. This running shoe is lightweight and offers great support. I have run in GT 2000s, and while they are a little bit lighter (0.4 ounces) they are quite comparable in all other ways. 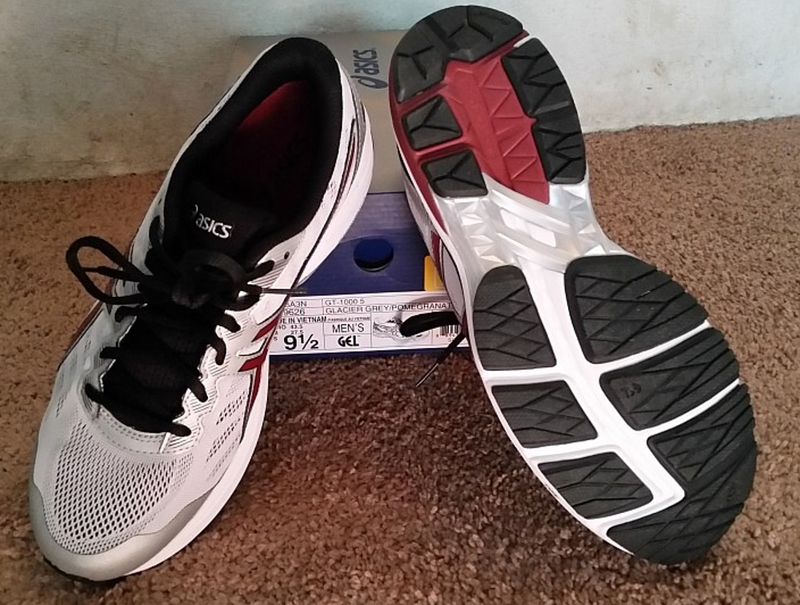 This running shoe is lightweight and offers great support. Asics focused the modifications in the upper and outsole in the 5th iteration of the GT 1000. A new engineered mesh brings in better air flow for enhanced breathability. It is also refined in some areas for additional lightweight support. The significant weight loss starts with the tongue and ankle collar that is no longer as thick as before. Both of these areas continue to be very plush without compromising weight. Additional reflective materials around the eyelets enhance low-visibility running in this shoe. In the outsole, there is a substantially bigger cut that runs from the heel to the forefoot. More than just helping cut weight, it offers enhanced flexibility and smoother transitions through the gait cycle. The flex grooves are also bigger and a bit deeper to take flexibility to another level. Asics gives the heel rubber more articulation to isolate shock and allow better compression for a little more cushioning. The GT 1000 5 has average space in the heel and midfoot with sufficient security in both areas. Runners with flat or inflexible feet will be delighted in the spacious toe box. It runs true to size. The slightly softer mesh offers a more glove-like fit for more foot-hugging security and comfort. The outsole of the 5th edition of the GT 1000 is classic Asics. It uses large rubber pods that are separated by deep flex grooves. A huge vertical groove called the Guidance Line runs from the heel to the forefoot for enhanced movement from landing to toe off. Both the vertical groove and the horizontal versions deliver excellent flexibility, which is much-needed in a well-cushioned shoe with stability features. A tough carbon rubber is located in the heel and other critical areas while DuraSponge blown rubber adds a little cushioning and better traction. Same as in the popular Asics GT 1000 7, this shoe uses the Asics trademark, SpEVA, which brings the usual features of standard EVA, but with more durability without the typical weight. It runs the entire length of the shoe, which should go in tandem with the Guidance Line for improved transitions. The Duomax Support system is made of two layers of foam that become denser as it reaches the midfoot, beneath the arch. It props up the arch and the medial side of the heel to the midfoot for support. The award-winning and silicon-based Gel cushioning units are placed in the heel and the forefoot for more shock attenuation. Lastly, the proprietary Guidance Trusstic System in the midfoot stabilizes the ride even more and helps with torsional rigidity. A fairly soft mesh that is very breathable and synthetic overlays dominate the upper of the Asics GT 1000 5. Asics’ logo on both sides of the shoe provide substantial structural support to the upper. The midfoot overlays extend to the heel to form part of the heel support system as well. Both the tongue and collar are moderately padded for additional comfort.